Coelacanth fish. Computer artwork of a coelacanth fish (Latimeria chalumnae) swimming through the Paleo Tethys Sea, 390 million years ago during the Middle Devonian period. Coelacanths were thought to be extinct until, in 1938, a specimen was caught off the coast of South Africa. The species had long been known to local fishermen as kombessa. 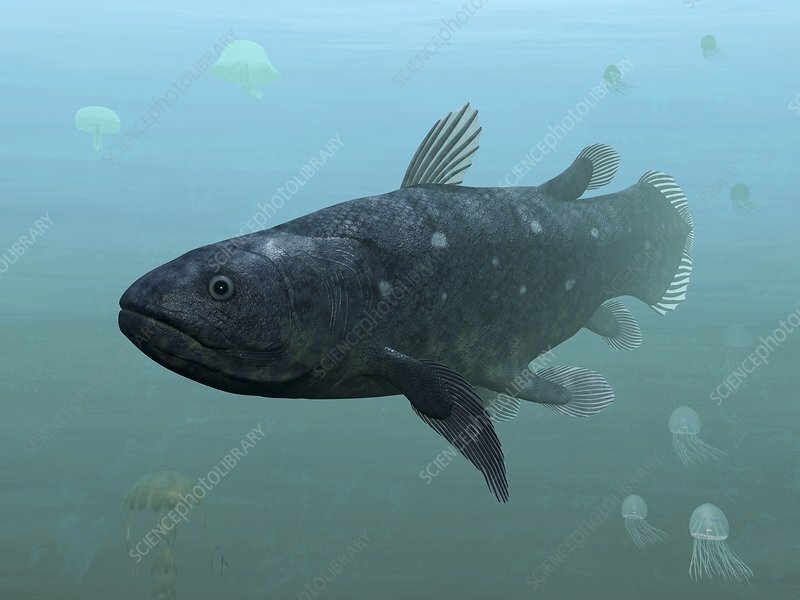 The coelacanth survives as the only known living member of a class of lobe-finned fish that flourished in the Mesozoic Era, 400-60 million years ago. It was initially thought that their strong fleshy fins were used for swimming and for crawling on land, and that these fish were a step in the evolution of land animals. Coelacanths, however, are unable to walk.